We are launching a new service opportunity for Homewood members. 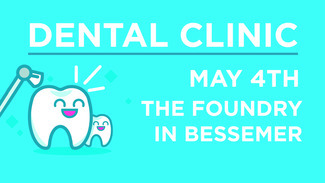 Working with our own Dr. Ben Kellum and others, we will be helping The Foundry in Bessemer provide free dental services on May 4. We are looking for volunteers who would like to help. There are 2 time slots available to sign up for, and we are needing 20 volunteers per shift. Opportunities include working with patients, assisting dental professionals and helping with community outreach (food, inflatables, prayer area, etc.). Individuals interested can sign up here. Homewood always rises to the occasion at times like this. We know you will again this time!